Eczema (atopic dermatitis) is inflammation of the skin. It is a skin disorder that is not contagious. There are several types of eczema but all types of eczema cause itching and redness on the skin. The main symptom is itching. Eczema is regarded as the most common skin disease of childhood. The number of people with eczema is rising and has tripled in recent years. Now 20% of people in the developed world have eczema, and unfortunately its mostly babies and children who are suffering. 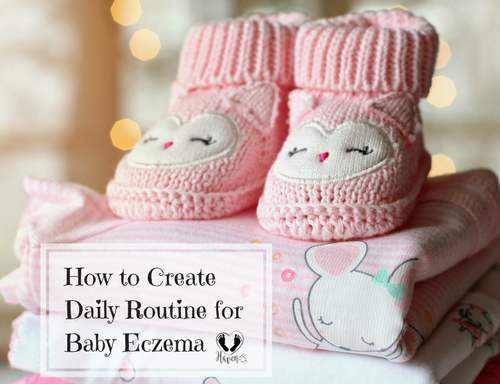 Eczema can appear soon after birth. 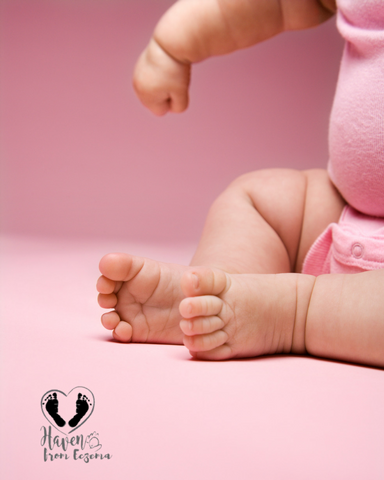 In the early stages, eczema can show up on the baby’s cheeks, chin, forehead, feet, legs, hands and arms. Later, the baby may develop eczema in the creases of their elbows, behind the knees and behind the ears. While the exact cause of eczema is unknown, researchers do know it is caused by a combination of genes and an environmental trigger such as an irritant or allergen. Eczema cannot be cured, but there are many ways of controlling it. Our skin barrier is made up of fats and oils that keep water and nutrients in the skin and keep bacteria, allergens and irritants out. In healthy skin, the outermost layer, the corneal layer (visible part of the skin), protects the body from germs. Also, the outer layers of the skin constantly renews itself as new cells grow. See the diagram below. In people with eczema, the corneal layer does not provide enough protection leaving the skin dry. When the skin is not properly hydrated it will crack, so the barrier becomes compromised and irritants, microbes and allergens can easily penetrate causing eczema flare-ups. This is why hydration is really important for an intact barrier. 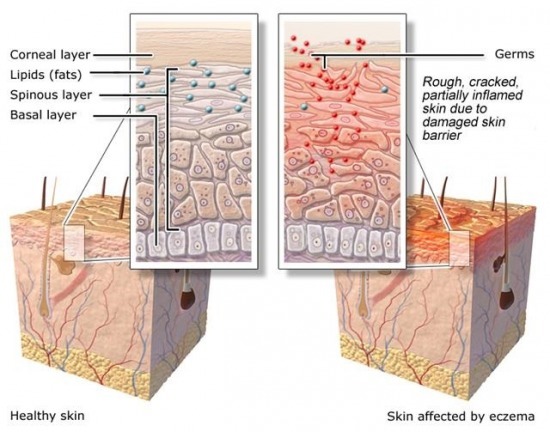 In addition to having an ineffective skin barrier, people with eczema have mutations in the FLG gene, which encodes the protein filaggrin, which the body needs to make the skin’s outer layer. Because there isn’t enough filaggrin, the balance of fats in the skin changes, causing the skin to lose a lot of moisture. The damaged skin also provides less protection from irritants, allergens (substances that can trigger allergies) and germs that might cause infections. When the skin is dry, it easily becomes brittle or scaly which can lead to an eczema ‘flare-up’ (eczema worsens). When eczema worsens, red (inflamed) and itchy rashes develop, sometimes forming blisters that easily break, leak liquid (weep or ooze) and crust. This makes the skin very itchy, which can become unbearable. And when the skin is scratched and irritated, it can lead to further breakage of the skin and cause skin infections such as staph. When a baby has a food allergy or sensitivity, a reaction to the food can also trigger an eczema flare-up. Food does not cause eczema, it is the allergy to a food which can make eczema symptoms worse. Nonetheless, baby eczema is often associated with food allergy or sensitivity. The triggering foods may be in the diet of the breast-feeding mother or in the diet of the baby if he or she is formula-fed or has begun to consume solid foods. The foods most frequently identified as allergens were eggs, milk, and peanuts. While most food-related symptoms occur within two hours of ingestion, often within minutes, delayed reactions are most typically seen in those who develop eczema as a symptom of food allergy. 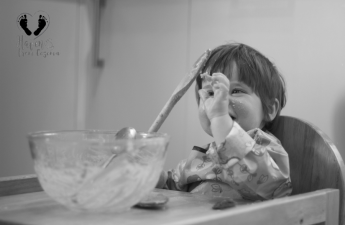 In babies, the first symptoms of a food allergy may be exhibited as prolonged colic-like symptoms and eczema and hives in the skin. Thus by eliminating the foods that trigger the symptoms often leads to a significant improvement in the eczema. Of course every baby is an individual. Your baby may have become sensitive to foods other than those listed among the food allergens that commonly trigger eczema. If the elimination of the trigger foods does not result in improvement of your baby’s eczema, continue to eliminate other foods. Keep a journal of records of both mother’s and baby’s diet and of baby’s symptoms. Important: Most food allergic/sensitive babies and children are at an increased risk of nutritional deficiencies especially when they have allergies to commonly used allergens such as milk, soy, eggs, and wheat. Providing safe food can be challenging and a balancing act. Nutrition monitoring and focusing on “key” nutrients to decrease risk of nutrition related problems is critical. Preservatives – chemical preservatives are used to increase the shelf life of products by delaying the growth of bacteria and fungi. Colorings – colorings are used to make our food look attractive to eat. Many processed and pre-packed foods would not look as appetizing with the absence of color. Flavor enhancers- these make our foods taste stronger and are often used in savory products. Antioxidants – antioxidants prevent fatty foods from becoming rancid or changing colour (these work by reducing the chance of fats combining with oxygen). Stabilizers and emulsifiers – stabilizers help keep food compact and together whilst emulsifiers help mix oil and water within foods. Sweeteners – artificial sweeteners are low-calorie or calorie-free chemical substances that are used instead of sugar to sweeten foods and drinks. There is some suggestion that artificial colorings and preservatives may make eczema worse in a small proportion (less than 3%) of children with eczema. It is extremely difficult to pinpoint the foods that may be affecting an individual’s eczema. But, the general rule of thumb is to eat a diet based on fresh, home cooked food. When buying processed or pre-prepared foods, check the labels for any particular additives you wish to avoid. There are no allergy tests for colorings and preservatives, so it is difficult to be certain which additives, if any, are causing a worsening of the condition. 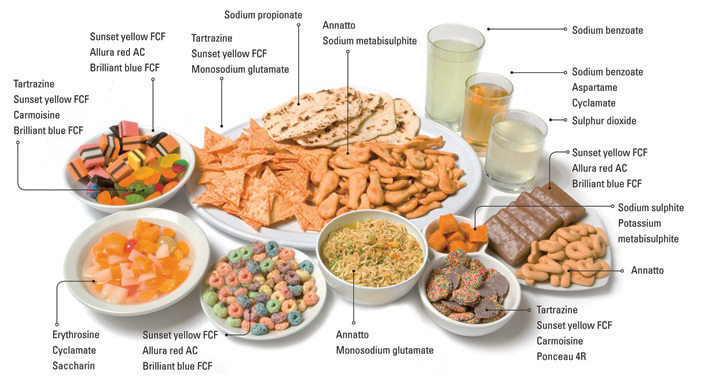 You can find the list of food additives here. Follow the advice column on which ones are safe, which ones to watch out for (caution) and which ones to avoid. Eczema can also occur as response to an allergic reaction to environmental allergens such as dust mites, grass, mold spores, animal dander, and pollen, etc. Older children are more susceptible to environmental allergens as to food allergens. Babies usually need to be exposed to environmental allergens for one or two seasons before seasonal allergies show up. When eczema is triggered by a food allergy through an inflammatory response, allergens gain access to the immune cells through the non-intact skin of eczema (that were induced by earlier food allergy). This can lead to other symptoms such as nasal stuffiness (rhinitis) and wheezing (a symptom of asthma). The skin can also be irritated by environmental factors or other substances that are not allergens. 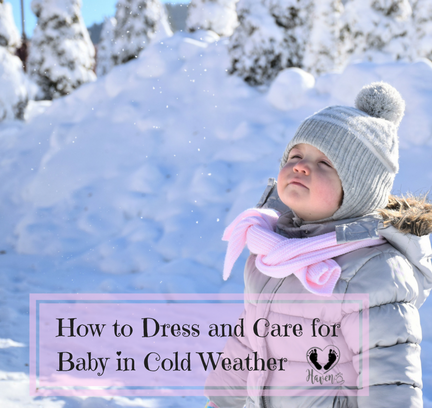 These include rough or scratchy fabrics in contact with the skin such as wool, cigarette smoke, dry air, wind and extreme heat or cold. Skin care products can also cause eczema to flare or even an allergic reaction. Symptoms of an reaction or irritation may even appear right after the skin product was used. Fragrances and preservatives are often to blame. Even products that say they are “unscented” can have a fragrance used to cover up chemical scents. Ultimately, skin care products can damage the skin barrier function and delay healing of the skin. Its very important to familiarize yourself with these problematic ingredients, read product labels carefully and avoid using products that can irritate the skin. In our personal experience, we found that my son’s skin was reacting mostly to the irritants found in his skin care products, soaps and laundry detergents. Once we made the switch to more natural and “eczema-safe” ingredients, his skin improved dramatically. 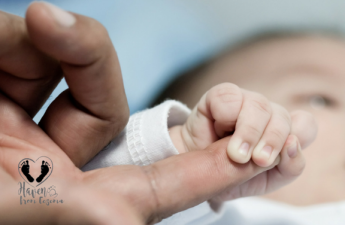 Note: While your baby may have all of these symptoms of eczema or only just a few, the most important thing to remember is that eczema and its symptoms are different for everyone. The only way to know for certain if your baby has eczema, is to visit your baby’s doctor. Next: What are the Potential Effects of Eczema on My Baby? My son has skin problems when he eats food containing artificial food dyes. We use black cumin oil for the skin. Only this helps. Thanks for your comment. I agree artificial food dyes can contribute to eczema and are also linked to hyperactivity in a child’s behavior. Black cumin oil has amazing healing and anti-inflammatory properties, I’m glad to hear this helps your son.